Western-backed opposition fighters and a faction of al-Qaeda -linked rebels turned their guns on each other Saturday in Syria's largest city, battling for control of a key checkpoint in the latest eruption of infighting among the forces trying to topple President Bashar Assad's regime, activists said. 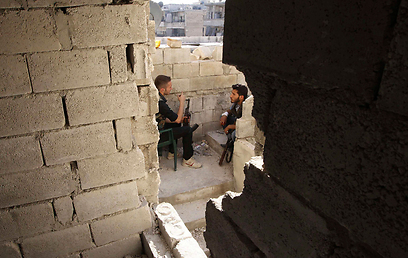 The clashes between rebels affiliated with the Free Syrian Army and fighters from the Islamic State of Iraq and the Levant throws a spotlight on the growing phenomenon rebel-on-rebel violence that has sapped strength from the broader anti-Assad movement. It also underscores the rebels' enduring inability more than two years into the conflict to unite around a unified command, as well as the deepening rift between more secular opposition fighters and Islamic extremists in the rebel ranks. The Britain-based Syrian Observatory for Human Rights said Saturday's clashes were focused on the strategic checkpoint in Aleppo's Bustan al-Qasr district that serves as the sole gateway between rebel-held eastern districts and the government-controlled areas in the west. Earlier this week, al-Qaeda-linked terrorists seized the checkpoint and closed it for several days, cutting the flow of food supplies to the rebel-held quarters of the city. That spurred protests by residents suffering from food shortages at the start of the Muslim Holy month of Ramadan. The Observatory said the fighting rattled the neighborhood throughout the morning, but subsided by the afternoon as the al-Qaeda-linked rebels pulled out of the area. It was not clear which group was in control of the checkpoint, where residents were staging a protest to vent their anger at soaring food prices. The area also witnessed clashes between rebels and government troops. Meanwhile, Al-Jazeera reported that an air raid on Syria's famed Crac des Chevaliers castle, a UNESCO World Heritage site, has damaged one of the fortress's towers. Several videos posted online on Saturday showed at least one air strike on Friday against the Crusader castle in central Homs province, where fighting is raging between government troops and rebel forces. The Syrian Observatory for Human Rights, an activist group, could not confirm direct hits on the castle, but said there were reports of three air strikes in the area on Friday. One of the most troubling outbursts of infighting among opposition fighters took place Friday, when the FSA said one of its commanders, Kamal Hamami, was shot dead by al-Qaeda militants in the Jabal al-Turkoman mountain area in the coastal province of Latakia. Hamami, known as Abu Basir, served in the Supreme Military Council of the Free Syrian Army, a group headed by a secular-minded moderate that has the support of Western powers. Activists monitoring Syria's more than 2-year-old conflict have previously reported sporadic infighting among rebel groups over control of the territory they've captured in the north along the border with Turkey. Those clashes were mostly between Kurdish and Arab rebels, and have subsided since a ceasefire agreement was reached earlier this year. The fighting between moderate and jihadi groups that have for months battled Assad's regime together have become more frequent in recent weeks. The clashes have largely focused on border crossings with Turkey and vital installations, like bakeries, water wells, petrol stations and checkpoints in the north, according to the Observatory. Another activist said the fighting is aimed at establishing control over the flow of food and aid to the residents. Each group is also trying to set up governing structures over the territory in the north the opposition has controlled for a year and take a cut of money from goods being smuggled into Syria over the border with Turkey. The activists did not want to be quoted by name for fear of reprisal from both groups. Militant Islamic groups, including those with links to al-Qaeda, have been the most effective fighting force on the opposition side in the past year, spearheading many of the attacks that captured military bases, towns and villages and whole neighborhoods in Aleppo. In late February, Islamic battalions led the assault and conquered the eastern city of Raqqa, making it the first Syrian city to entirely fall under rebel control. 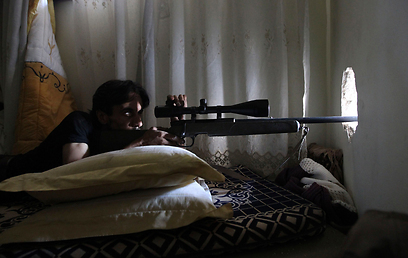 Moderate factions are now fighting jihadi groups for a say in running of Raqqa. 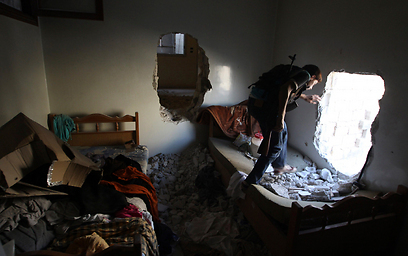 See all talkbacks "Syria: Rival rebel factions fight in Aleppo"